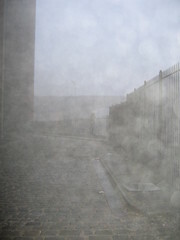 The flash-lit fog over the cobbles in this photo reminds me of a painting or pencil sketch I’ve seen somewhere, but I can’t find it. Maybe the image resembles a faded century-old photo. I like the effect. I’m in the photo taking a picture of The Palace Hotel’s sign glowing in the gloom. Arteth’s mention of Vallette led me to his painting of Albert Square and this drawing by Lowry.